Last C.C. I mentioned the famous Kopec v Condie Troon 1980 game. tactic (see later) the game is quite interesting and instructive. not save the game) 19.Nxg6+ Kh7 20.Nf8+ Kh8 21.Qh7+ Nxh7 22.Ng6 mate. excellent book 'Blunders & Brilliancies.' No 107, page 40. 1 Qb3 and won a strong game in his best positional style. Now the clue here is what Ian wrote in the first sentence. game played earlier could not be unearthed. plus thousands of books), had to be done by hand. find the original game that Roddy mentioned. perhaps Roddy just added the Polish players bit to wind up Danny. By simply turning up at the board he psyches you out. critical position but cannot find it. question and recognised it and then he too saw the combination. it was simply that: I had already seen the position." Which enhances something I've been saying here for years. Every combination you play you will have seen before. then Set up, study and solve some more. You will suddenly get good. Alan also emailed me his research regarding this position. of Deutsche Schachblätter printed this game. It is a Correspondence game from 1933/34. again in other writings - Alan McGowan). Deutsche Schachblätter 1935, 1 April issue (! ), page 104. Thank you Alan McGowan for your excellent contribution. My faith in Roddy has been vindicated. See. Even the very good and gifted players study. players the missed win. So I called and spoke to Mark Condie. showed us the win saying it had been played before. it was Roddy who showed him the missed win." Roddy told someone else that Danny had missed a shot. However Alan states he too saw the missed win. I believe him. of the Edinburgh University players. Ah the good old days. everyone else's games spotting errors. when this position arose with Black to play. Black missed 69...Rxg3+ winning the Queen. Dougie played 69...Qc1? and lost. "...and a murmur went around the tournament hall." That was me. I'm murmur going around the tournament hall. 12 Qd3 and resigned soon after 12...Nxf2. or 12 Qxe4. He is right. Here is the full game. Let us finish with a couple of McKay shorts. The first is from Charlton 1983. Black is Kevin Wicker who in 1981 wrote '200 Modern Brilliancies'. Pity he did not wait a couple of years, he could added this one. This next one is from the Scottish Championship 1988. 2270 when this game was played. After 6 moves White has a Pirc. 6 moves later Black resigned. from 1985 onwards. My 1970-85 copy is a bit battered these days. Keith Ruxton told me he picked up a 2nd hand copy the other day. He now has two - he may be willing to sell his spare. 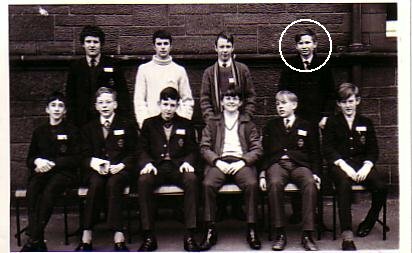 Who is the circled chappie. It was taken in 1970. Every Scottish chess player knows him. Clue: He does not play much, just 6 games last year. But he does attend a lot of tournaments.